Find My Workspace lists over 95% of the business centres market in Cambridge. Simply click Request Quote to check pricing for one office, or Add to Basket for multiple offices. 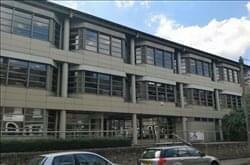 This centre offers high quality serviced offices in a great Cambridge location. The rooms with large windows make for a bright and airy workspace, perfect for educational tenants. The meeting room facilities are well-equipped and provide a professional environment. Tenants can take advantage of the WiFi that is installed throughout the building. The friendly reception team are on-hand to assist with clerical services and to greet any visitors you may have. There is an on-site canteen with usage that can be negotiated. Tenants and visitors can benefit from the free-onsite car park and outdoor patio area that has external seating. There are 10 large rooms, each approx. 6 x 6 metres in size (suitable for either classroom, meeting room or as a training venue).